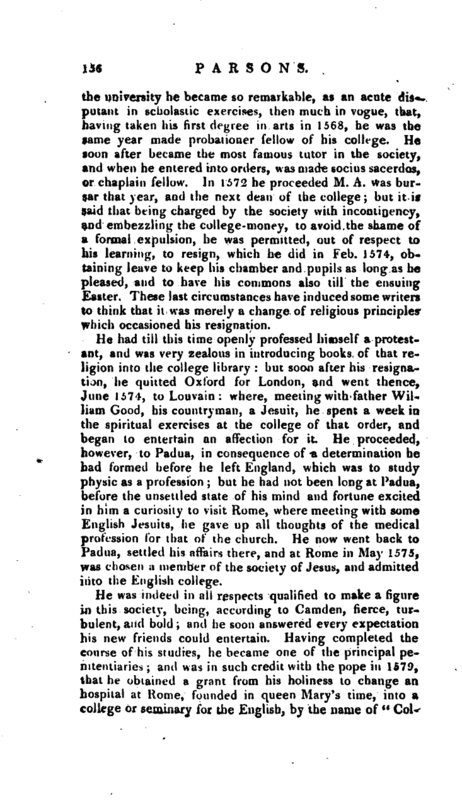 | the university he became so remarkable, as an acute disputant in scholastic exercises, then much in vogue, that, having taken his first degree in arts in 1568, he was the same year made probationer fellow of his college. He soon after became the most famous tutor in the society, and when he entered into orders, was made socius sacerdos, or chaplain fellow. In 1572 he proceeded M. A. was bursar that year, and the next dean of the college; but it is said that being charged by the society with incontinency, and embezzling the college-money, to avoid the shame of a formal expulsion, he was permitted, out of respect to his learning, to resign, which he did in Feb. 1574, obtaining leave to keep his chamber and pupils as long as he pleased, and to have his commons also till the ensuing Easter. These last circumstances have induced some writers to think that it was merely a change of religious principles which occasioned his resignation. He had till this time openly professed himself a protestant, and was very zealous in introducing books of that religion into the college library: but soon after his resignation, he quitted Oxford for London, and went thence, June 1574, to Louvain: where, meeting with father William Good, his countryman, a Jesuit, he spent a week in the spiritual exercises at the college of that order, and began to entertain an affection for it. He proceeded, however, to Padua, in consequence of a determination he had formed before he left England, which was to study physic as a profession; but he had not been long at Padua, before the unsettled state of his mind and fortune excited in him a curiosity to visit Ilome, where meeting with some English Jesuits, he gave up all thoughts of the medical profession for that of the church. He now went back to Padua, settled his affairs there, and at Rome in May 1575, was chosen a member of the society of Jesus, and admitted into the English college. He was indeed in all respects qualified to make a figure in this society, being, according to Camden, fierce, turbulent, and bold; and he soon answered every expectation his new friends could entertain. Having completed the course of his studies, he became one of the principal penitentiaries; and was in such credit with the pope in 157D, that he obtained a grant from his holiness to change an hospital at Rome, founded in queen Mary’s time, into a college or seminary for the English, by the name of “| Collegium de urbe,” dedicated to the Holy Trinity and St. Thomas (a Becket), where the students were obliged to take the following oath: “I. N. N. considering with howgreat benefits God hath blessed me, &c. do promise, by God’s assistance, to enter into holy orders as soon as I shall be fit, and to return to England to convert my countrymen there, whenever it shall please the superior of this house to command me.” He had no sooner seen this college established, and his friend father Allen chosen, by his recommendation, rector of it, than he was appointed to go as superior missionary to England, in order to promote the Romish religion in that kingdom, being the first ever appointed on such a business. 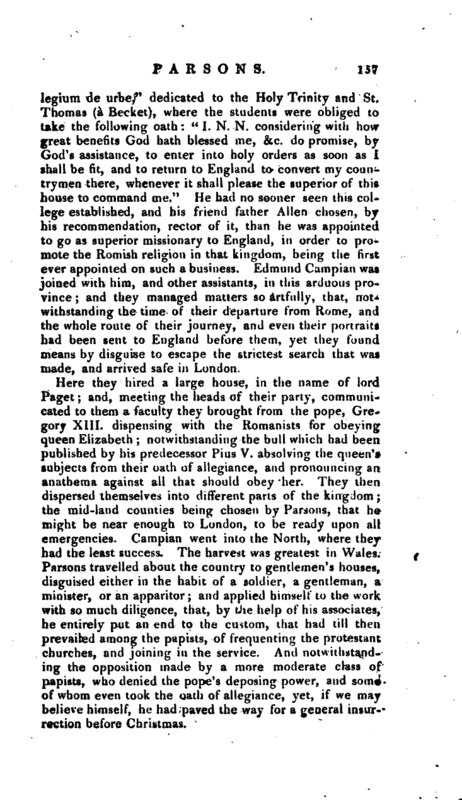 Edmund Campian was joined with him, and other assistants, in this arduous province; and they managed matters so artfully, that, notwithstanding the time of their departure from Rome, and the whole route of their journey, and even their portraits had been sent to England before them, yet they found means by disguise to escape the strictest search that was made, and arrived safe in London. Here they hired a large house, in the name of lord Paget; and, meeting the heads of their party, communicated to them a faculty they brought from the pope, Gregory XIII. dispensing with the Romanists for obeying queen Elizabeth; notwithstanding the bull which had been published by his predecessor Pius V. absolving the queen’s subjects from their oath of allegiance, and pronouncing an anathema against all that should obey her. They then dispersed themselves into different parts of the kingdom; the mid-land counties being chosen by Parsons, that he might be near enough to London, to be ready upon all emergencies. Carnpian went into the North, where they had the least success. The harvest was greatest in Wales. 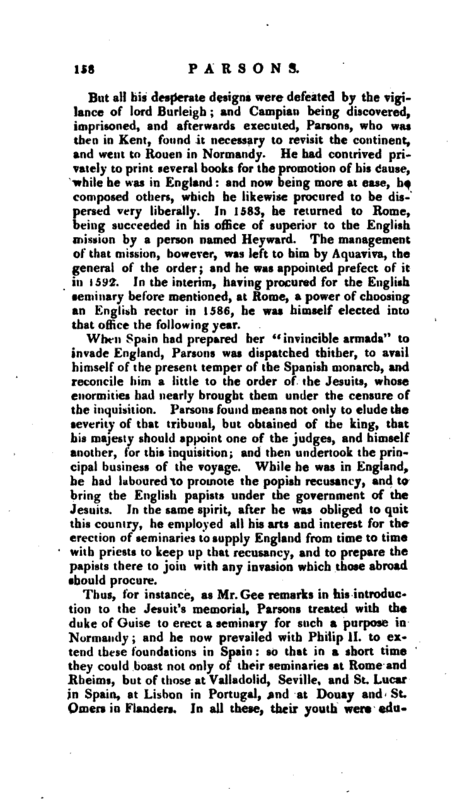 Parsons travelled about the country to gentlemen’s houses, disguised either in the habit of a soldier, a gentleman, a minister, or an apparitor; and applied himself to the work with so much diligence, that, by the help of his associates, he entirely put an end to the custom, that had till then prevailed among the papists, of frequenting the protestant churches, and joining in the service. And notwithstanding the opposition made by a more moderate class of papists, who denied the pope’s deposing power, and some of whom even took the oath of allegiance, yet, if we may believe himself, he had paved the way for a general insurrection before Christmas. | But all his desperate designs were defeated by the vigilance of lord Burleigh; and Campian being discovered, imprisoned, and afterwards executed, Parsons, who was then in Kent, found it necessary to revisit the continent, and went to Rouen in Normandy. He had contrived privately to print several books for the promotion of his cuuse, while he was in England: and now being more at ease, he composed others, which he likewise procured to be dispersed very liberally. In 1583, he returned to Rome, being succeeded in his office of superior to the English mission by a person named Heyward. The management of that mission, however, was left to him by Aquaviva, the general of the order; and he was appointed prefect of it in 1592. In the interim, having procured for the English seminary before mentioned, at Rome, a power of choosing an English rector in 1586, he was himself elected into that office the following year. When Spain had prepared her “invincible armada” to invade England, Parsons was dispatched thither, to avail himself of the present temper of the Spanish monarch, and reconcile him a little to the order of the Jesuits, whose enormities had nearly brought them under the censure of the inquisition. Parsons found means not only to elude the severity of that tribunal, but obtained of the king, that his majesty should appoint one of the judges, and himself another, for this inquisition; and then undertook the principal business of the voyage. While he was in England, he had laboured to promote the popish recusancy, and to bring the English papists under the government of the Jesuits. In the same spirit, after he was obliged to quit this country, he employed all his arts and interest for the erection of seminaries to supply England from time to time with priests to keep up that recusancy, and to prepare the papists there to join with any invasion which those abroad should procure. Thus, for instance, as Mr. Gee remarks in his introduction to the Jesuit’s memorial, Parsons treated with the duke of Guise to erect a seminary for such a purpose in Normandy; and he now prevailed with Philip II. to extend these foundations in Spain: so that in a short time they could boast not only of their seminaries at Rome and Rheims, but of those at Valladolid, Seville, and St. Lucar in Spain, at Lisbon in Portugal, and at Douay and St. Omers in Flanders. In all these, their youth were | educated with the strongest prejudices against their country, and their minds formed to all the purposes that Parsons had in his head. Among other favourite objects, he obliged them to subscribe to the right of the Infanta of Spain to the crown of England, and defended this position in his “Conference about the next succession to that crown,” which went so far as to assert the lawfulness of deposing queen Elizabeth. The secular priests likewise inform us, that, after the defeat of his designs to dethrone that queen, while he stayed in England, he consulted with the duke of Guise in France upon the same subject; and endeavoured to make a list of catholics, who, under the conduct of the duke, were to change the state of England, upon pretence of supporting the title of Mary queen of Scots. After the defeat of the armada in 1588, he used every means in his power to persuade the Spanish monarch to a second invasion; and when he failed in this, he endeavoured to raise a rebellion in England, urging the earl of Derby to appear at the head of it, who is said to have been poisoned, at his instigation, for refusing to acquiesce. Nor did he stop here. We find sir Ralph Winwood informing secretary Cecil from Paris, in 1602, of an attempt to assassinate the queen that year by another English Jesuit, at the instigation of father Parsons; and when all these plans proved abortive, he endeavoured to prevent the succession of king James by several means; one of which was, exciting the people to set up a democratic form of government, for which he had furnished them with principles in several of his books. Another was, to persuade the pope to make his kinsman the duke of Parma king of England, by joining with the lady Arabella, and marrying her to the duke’s brother, cardinal Farnese. 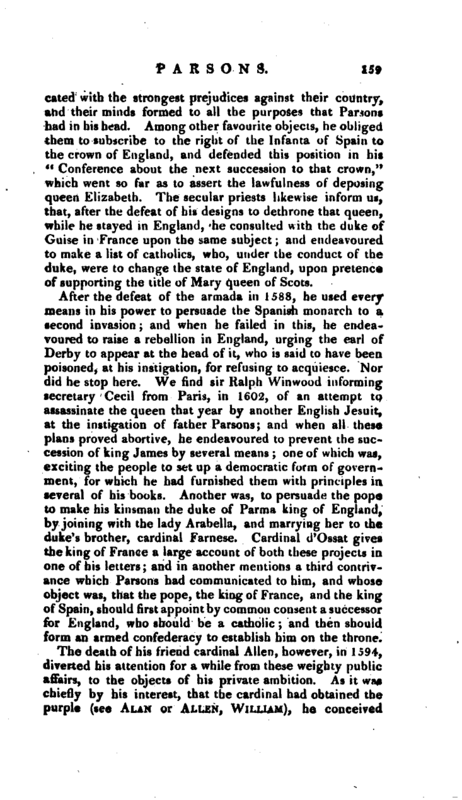 Cardinal d’Ossat gives the king of France a large account of both these projects in one of his letters; and in another mentions a third contrivance which Parsons had communicated to him, and whose object was, that the pope, the king of France, and the king of Spain, should first appoint by common consent a successor for England, who should be a catholic; and then should form an armed confederacy to establish him on the throne. 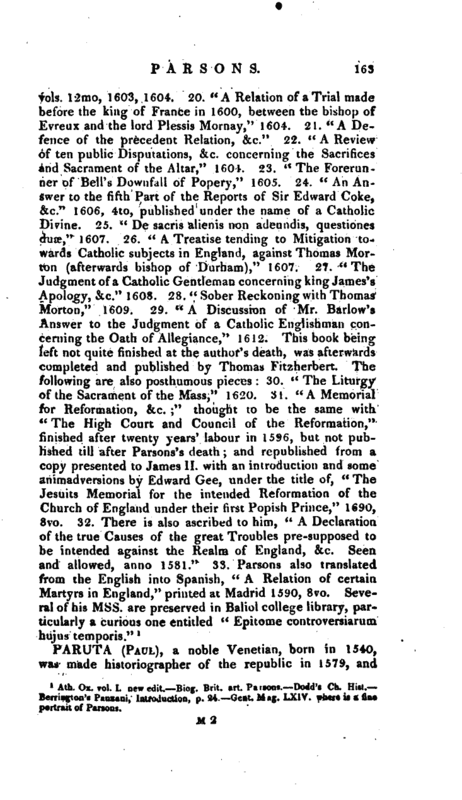 The death of his friend cardinal Allen, however, in 1594, diverted his attention for a while from these weighty public affairs, to the objects of his private ambition. As it was chiefly by his interest, that the cardinal had obtained the purple (see Alan or Allen, William), he conceived | great hopes of succeeding him in it. The dignity was worth his utmost endeavours, and he spared no pains to compass it. Among other efforts he employed some Jesuits to obtain in Flanders a petition to the king of Spain, in his favour, subscribed by great numbers of the lowest of the people, as well as those of superior rank. He applied also to that monarch by John Piragues, one of his prime confidents, but received no answer; and then went himself to Rome in 1596, under pretence of settling some disputes, that had arisen in the English college there during his absence. He had the year before been complimented, in a letter from some of the principal persons of his order there, on the assured prospect of success; and upon his arrival was visited, among others of the highest rank, by cardinal Bellarmin, who encouraged him to wait upon the pope. At this interview he entertained the pontiff with an artful account of the reports that were spread all over Flanders, and even at Rome, of his holiness’ s design to confer the purple upon him, and that the king of Spain had written to his holiness upon the occasion. Father More, who furnishes these particulars, tells us further, that Parsons made a modest speech, as usual on such occasions, intimating that he feared he was unworthy of so high an honour: but he was much mortified when the pope, Clement VIII. who was more in the secret than he supposed, assured him, that he had heard nothing from the Spaniards upon any such subject; that idle reports were not to be minded; that he was very well satisfied with his services, and exhorted him to continue in the same course. The truth appeared to be, that the pope having received many complaints of him from the secular clergy, instead of bringing him into the sacred college, had some thoughts of stripping him of the posts he already possessed. 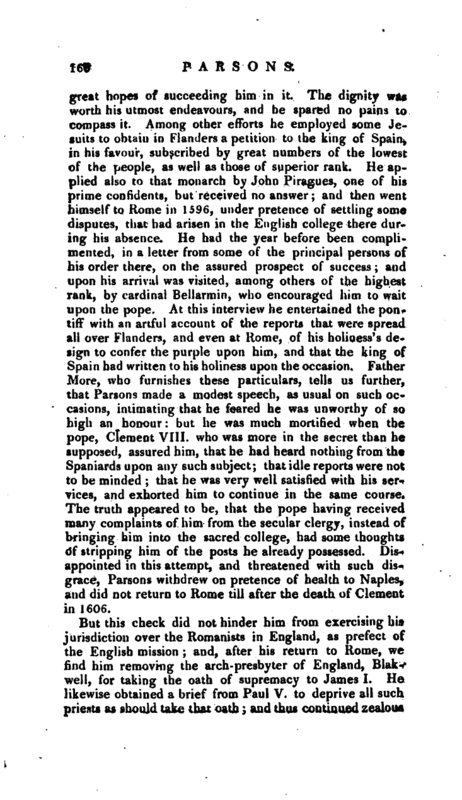 Disappointed in this attempt, and threatened with such disgrace, Parsons withdrew on pretence of health to Naples, and did not return to Rome till after the death of Clement in 1606. But this check did not hinder him from exercising his jurisdiction over the Romanists in England, as prefect of the English mission and, after his return to Rome, we find him removing the arch- presbyter of England, Blakwell, for taking the oath of supremacy to James I. He likewise obtained a brief from Paul V. to deprive all such priests as should take that oath; and thus continued zealous | an the discharge of this office to the last. Father More lias given copies of three letters, one to the mission in England, another to the rector of St. Omer’s, and the third to the arch-presbyter Berkit, successor to Blakwell; all dictated by him, while he lay past recovery in the opinion of his physicians. The last was finished the 13th of April; and the fever, which had seized him on the I Oth, put a period to his life on the 18th, 1610. Pope Paul, as soon as he heard of his illness, indulged him in all the ceremonies usually granted to cardinals at the point of death. His body was afterwards embalmed and interred, pursuant to his own request, in the chapel of his college at Rome, close to that of cardinal Allen. A monument was soon after erected to his memory, with an inscription; a copy of which may be seen in Ribadineira’s Bibl. Soc. Jes. under the letter P.
The character of father Parsons was variously represented by protestants and catholics, but even the latter are not agreed. More recent writers seem little disposed to elevate it, although belonging to the same communion. Berrington, who has drawn a very impartial character, begins with asserting that “intrigue, device, stratagem, and all the crooked policy of the Machiavelian school,” are associated with the sound of his name. Dodd, the general biographer of the popish writers, is not without a considerable degree of impartiality in characterizing Parsons, but yet appears more zealous to defend him than strict impartiality admits. 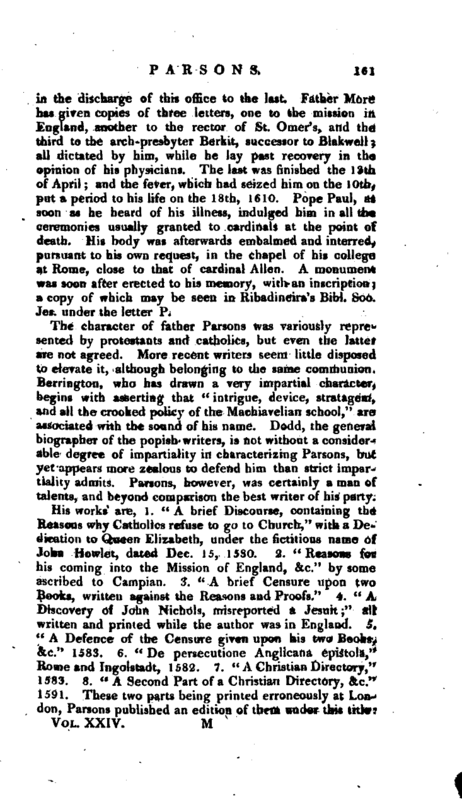 Parsons, however, was certainly a man of talents, and beyond comparison the best writer of his party. The intention of this book was to upport the title of the Infanta against that of king James, after the death of queen Elizabeth, and to prove that there are better titles than lineal descent. It is remarkable that this weapon, which was obliquely aimed at Elizabeth, should afterwards be employed against Charles I. Ibbotson’s pamphlet concerning the power of parliaments, &c. which was published preparatory to the destruction of that prince, was no more than a republication of Dolemaa (or Pawns), with very few alterations. Bradshaw’s long speech at the king’s condemnation, and a considerable part of Milton’s “Defensio pro Populo Angl.” are chiefly borrowed from the same performance and it was even reprinted in 1681, when the parliament were debating the subject of the exclusion of the duke of York; but in 1683 the university of Oxford ordered it to be burnt by the hands of the hangman. 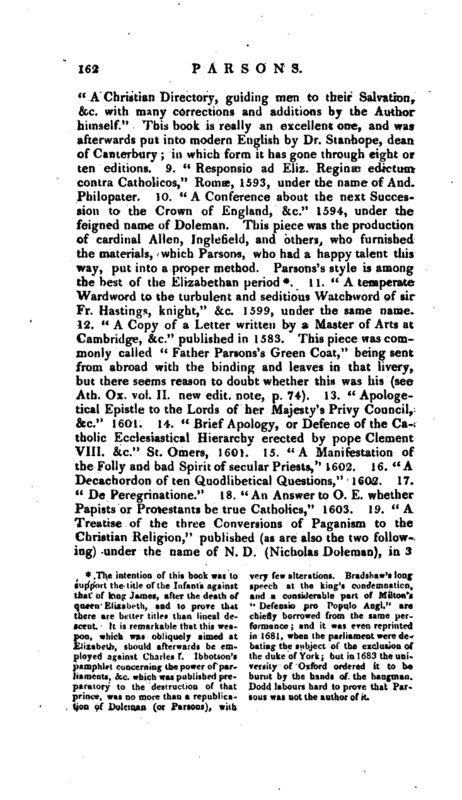 Dodd labours hard to prove that Parlous was not the author of it. 1 Ath. Ox. vol. I. new edit. B log. Brit. art. Patsons. Dodd’s Ch. Hist. 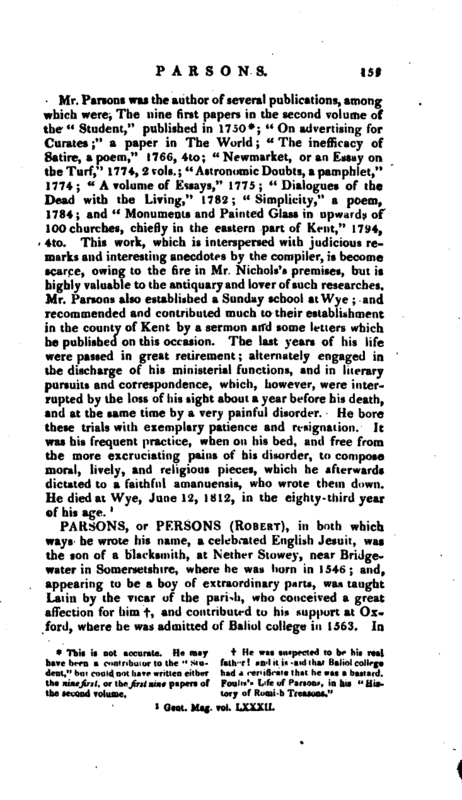 Berrington’s Panzant, Introduction, p. 24. —Gent, Mag. LXIV. where is a fine portrait of Parsons.